Venture deep into the Moroccan countryside during this rugged excursion, with private pickup from Marrakesh. You’ll visit spectacular locations in the Atlas Mountains, without skimping on comfort. Hop a camel to reach your Berber campsite, and sleep under the stars. Your guide will be on-hand to guarantee an insider’s view of life in the mountains, from traditional dinners to picturesque castles. You’ll also have time to visit local handicraft shops. My trip to Zagora desert was unforgettable! At 7 am someone of the agency picked me up from my riad and then we joined the rest of the group and left Marrakech. The road through Atlas mountains was very beautiful and the driver was very friendly and helpful. The minibus was also very comfortable with good air-conditioned. One of the best moment of the trip was the visit of the Ait Ben Haddou Kasbah which an amazing old city. At the end of the day we enjoyed a great camel ride at the sunset to join the campsite at the door of the desert. The evening was very good with berber animation and typical tagine. In the early morning we took the camel again to not miss the sunrise and finished with an amazing breakfast made by local people. The road to Marrakech was beautiful too, with many stops to admire Moroccan things. 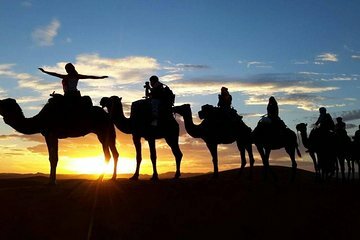 If you have short time and want to discover the Moroccan desert I can only recommand you this wonderful excursion! -The bus has no air conditioner and the seat was very uncomfortable. -In the morning we spend an hour in Marrakesh and waiting to our bus driver. -Our guide was completely unnecessary... he speaks mostly spanish, he only translate to us some information if we asked it. The second day he doesn't come back with us to Marrakesh, and the bus driver did not speak english, so we couldn't communicate to anyone. -In your description there is absolutely NO information about how long the journey is! It was 9 hours bus trip each day!!! PLUS THE STOPS! -In the bus trip we didn't see the historical castle that you promised. -Our dinner in Ouarzazate city was extremly expensive, small and bad... Our guide recommended this horrible restaurant. -WE MISSED THE SUNSET, because the bus stopped so many place just because they want us to buy something everywhere... You promised us that we will be able to view the amazing panoramic sunset. This was one of the main reason why we went to the desert and you're ruined it! We spent our money to see the sunset in the desert and we got nothing.... Oh, and the dunes of Zagora is not similar to the picture that you show in your description! -The camel ride was half hour each day... not 2 hours like you promised! -At the camp we get the dinner after 10 o'clock... and it was awful. -On the way back to Marrakesh, at the first stop the bus driver pick up a stranger who paid for him. I didn't feel safe. You are not keep what you're promised in your description, so in my opinion it was a customer deception. I paid 160 USD for this trip, I want 80 USD back, because I didn't get what I expect!